Upper rt prof; l[left] Lester Clinefelter; 3d down 2 over 2 l Otto Bethke #3; #2 Margaret Jones (Stone); Hep Shepley; Erickson; Lester Jones; Gladys Yates; The "New School" in L.O. cost 10,000. . Description Same as 371a; see 371a for more names. 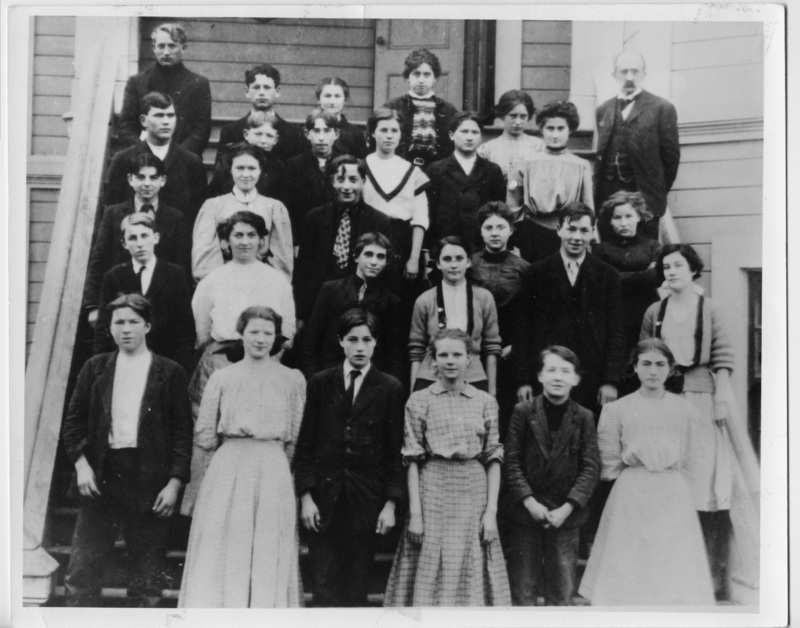 2 news stories give additional info: "1908 (or about 1910) students in the 7th, 8th and 9th (or 6th or 7th) grades at Oswego School. Bottom row, L to R: Heppell Shipley, Ira (Isa) Austin (now Gregory), Henry Gans (Gands), Ruth Erickson (now Rafferty), Lester Jones, Gladys Yates (now Mrs. George Emrich.). Second row, Orce Jones, Nina Worthington (now Mrs. Pete Emmott), Eugene (Glen)Waldorf, Tucie (Trucy)Todd (now Mrs. Clyde Churchill), Clifford Johnson, Arva Todd (now Mrs. Underwood). Third row: Clyde Churchill, Margaret (Laura) Jones, Otto Bethke, Mabel Churchill, Ettie Wilson. Fourth row: Willie (Bill) Nagle, Albert Rosentrater (Rosentreter), John (Jack) Conway, Mary Jarisch, Ray Duncan, Anna Duncan (now Potter). Top row: Lester Clinefelter (visitor), Thomas Elston, Harriet Duncan, Denna (Dena) Prosser, Bertha Elston (now Gillis), Clare G. Morey, teacher. Photo courtesy of Harriett (Duncan) Munnick"
Transcription Upper rt prof; l[left] Lester Clinefelter; 3d down 2 over 2 l Otto Bethke #3; #2 Margaret Jones (Stone); Hep Shepley; Erickson; Lester Jones; Gladys Yates; The "New School" in L.O. cost 10,000. .